Leslie Jensen was born in The Danish town Elsinore, the city of Shakespeare's Hamlet, on the 17th of October 1957. He took up Karate in January 1974 in the Swedish town of Helsingborg due to the fact that it was the closest club to his home. In November 1974 he moved to Sweden and already in January of 1975 he entered his first National competition and became runner up, winning the Silver medal as a yellow Belt. He was soon to be picked for the Swedish National Team where he stayed as a permanent member until his retirement from competition in late 1991. While he pursued his goals in Karate he also took an Engineering degree in Telecommunications and held a full time job while he competed. He graded Shodan in May 1978 with Enoeda Sensei in London and today he holds 7th DAN with the JKA. He won The ESKA Individual Kumite in 1991 and he has won several medals in both ESKA, WSKA, EKF and WKF championships. He has two Nordic titles and 11 times Swedish Champion Individual and Team. Leslie also have his own club, Engelholms Shotokan Karate Club, since 1982, where he teaches traditional JKA Karate and the value system that are incorporated in it. He has students that are now members of the National Team in Kata. In the early nineties he was National Team Coach for the Swedish WKF Junior Kumite team and he has also been a member of the Swedish Karate Federation Executive Committee. He held the position of Chairman of the National Referee Committee as well. His referee career began while he was still competing and as soon as he retired he focused on becoming an International Referee. 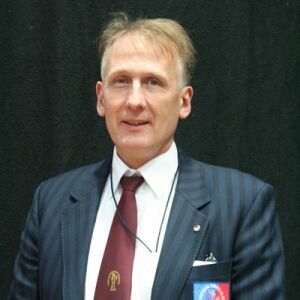 In June 1993 he passed Judge in Kata and Kumite at the ESKA Championship in Wales and in November 1994 he passed Referee in Kata and Kumite in Poland.